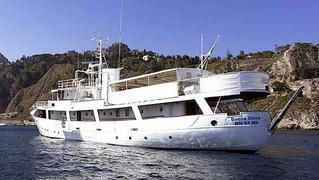 Aloisa Moncada at Moncada Di Paterno sends news of a €600,000 price cut to the 35m motor yacht Buena Chica. Built by the Nakskov Skibsvaerft yard in 1945, Buena Chica was last refitted in 2006 and offers accommodation for 14 guests in a master, two double and two twin cabins. Twin diesel-electric 270hp engines give this superyacht a range of 4,000 nautical miles at her cruising speed of 10 knots and the new asking price is €1.3 million.